I finally got my first set of Lunch Punches! I was so excited to use my new Sand*wishes* set, knowing that my little girly-girl would adore them. 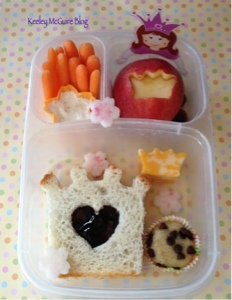 Little Miss has a princess crown sandwich done with the Queen of Hearts Lunch Punch. The sandwich is SunButter and Jelly, on Udi's Gluten (Nut, Dairy, and Soy) Free White Bread. To the right are colby jack cheese slices, cut out with my mini crown cutter and stacked inside. Top left are baby carrots with a small silicon flower cup of Heluva Good French Onion Dip. Top right is half an apple with a princess crown cutout revealed. Under the apple are red seedless grapes. Little Miss is gonna dig this one! I love this one! You really prove that despite allergies you don't have to miss out on anything especially not fun lunches! I love your new princess pix, too. So cute! Happy Monday! Aww thanks so much Nina!! Please tell me how you got your punch to work so beautifully! I have that set and I have tried over and over with different breads at different levels of freshness and I get the worst results! It's always a crushed nasty looking mess! If I try to do the 2 slices of bread seperate they don't seem to match up! I'm sorry you've had bad luck with them Dina! I actually do cut the two pieces separate, just like when I use a cookie cutter or other sandwich cutter. I didn't have any issues... Keep trying??!! We got our Lunchboxes and a few other items seen on your blog....veggie and fruit cutter, silicone baking cups, etc....can't wait to use them ..... thanks for the great ideas you always have !